There are great skills hidden in the Irish recruitment workforce. Declan Fitzgerald who you all know very well by now if you are readers of this blog, have created a browser toolbar for Microsoft Internet Explorer and Firefox. 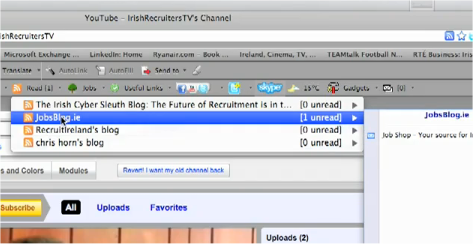 Irish Recruiters Toolbar is represented on a video, and you can see the video and download the toolbar on Declans blog. Thanks for putting Jobs Blog in the video Dec!